hero's cape, from the "magic suitcase." and yet to come - is her defeat! Strawberry, Strawberry - fights dumb mold. Strawberry's parents are nice, but old. Super Strawberry was planning a big surprise. by Shelby, a Sixth-Grader in Mr Peddycord's class. This is a poem sent by Meagan M.
But then turned red and fried! not able to change any more! Here is a poem by Lindsey J. Her dad was a melon her mom was an orange. under the deli meat bridge. Now where is this critter from? All we know is that she fights. "this day has been such a dread!" Here is a poem sent in by Brittney J.
but please go brush your teeth. 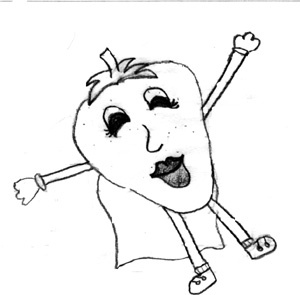 whose illustration of Super Strawberry is above. you'd think he'd trim it every day! I know that there is not a little there is alot! at christmas she goes crazy, riging the christmas chime! but then I remember..... she is my best friend and in my heart she fits! and black hair, hazel, blue, and brown eyes. but they're not on the love course! and we share one big huge heart! he is black and has a face that melts you and it's true! and next time someone see's him...... the story they will know!! Here is a poem by Hilary, a 5th grader at Elmwood. The shark was evil and funny! But when he's mad you better runny! His evil grin was very scary! His nose was small and very hariy! If he fools you with his grin! You better make a simaler fin! He has sharp little teeth! He could crunch a tiny leaf! If he tricks you you better run! Don't think it's not very fun! Now he's full and bloated! The kid was burnt and coated! The following two poems are from Mr. Lawrence's room. It seems like its made by a smelly old ghost. It seems like it's made with flubber. Well that's all I can think of so got to go. So see you later at the North Pole! Just as much as I hate Fleas. if you see him run! because he is not much fun! he'll try and play a trick on you! because evil things he likes to do! take no chances run away! I say "Ten more minutes Mommy, Please!" But my favorite feelings are the ones I can paint with Ink. Here is a new poem by Lindsey, who is now a student at St. Joan of Arc! Christmas is here and the malls are getting hectic. Children get their presents and say wow! I didn't expect that! But what we all should remember is the love that we are try to share. the love between us all can never be compared.